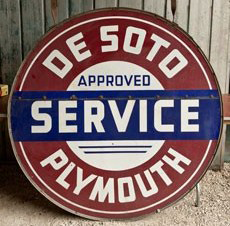 This is a round De Soto Plymouth Service porcelain sign. This particular De Soto Plymouth Service sign is maroon, blue and white with white text. It reads, “De Soto Plymouth Approved Service” and features a thin white border.